Jewelry, perhaps more than any piece of clothing or other fashion accessory, can mean so much to its owner. A single ring, bracelet, necklace, or other item of jewelry can hold very special significance and be passed down from one generation to the next as a true family treasure or breathtaking gift. A piece of jewelry can trigger such unique emotions and memories in people, and it needs to be unique in appearance too, with the best pieces of jewelry featuring truly original designs and superb stones that really stand out. If you're looking for high quality jewelry of all kinds, from engagement rings to daily bracelets and earrings, Lauren Wolf Jewelry is the brand to turn to. A wedding ring or engagement ring is one of the most significant pieces of jewelry in a person's life. It means so much and represents the love and memories you share with your partner, so it needs to be special. A luxury engagement ring is a great way to show your significant other how much they mean to you and how much you want to spend your life with them, while a deluxe wedding ring can be a constant reminder of the special bond you and your husband or wife share. · One of a Kind - The ‘One of a Kind’ range of rings from Lauren Wolf Jewelry features truly unique stones with their own amazing patterns and distinctive features. A one of a kind ring is a great way to symbolize the truly unique connection you and your partner have and how, in your eyes, they’re truly ‘one of a kind’ too. · Classics - The Classics collection of wedding and engagement rings from Lauren Wolf Jewelry features timeless engagement ring designs in both three-stone and octagon settings. Each ring features a black, white, or gray diamond central stone. · Women's and Men's Bands - Lauren Wolf Jewelry caters to both brides and grooms with a deluxe range of exceptional wedding bands. Available in various colors, sizes, and styles, each wedding band from Lauren Wolf Jewelry is filled with class and elegance. · Wedding Sets - Matching wedding and engagement rings always look elegant and stylish and you can purchase full wedding sets from Lauren Wolf Jewelry too. Designed with similar stones, themes, and colors, these wedding and engagement ring sets can get your marriage off to a stylish start. Check out the full range of wedding and engagement rings from Lauren Wolf Jewelry on the official site and start shopping today for your dream engagement ring. All rings can be adjusted and altered to suit different sizes and all are made to the highest possible standards. · Rings - A wide range of rings can be purchased from Lauren Wolf Jewelry in a range of colors and styles. From contemporary diamond rings to timeless signet rings and unique seashell and snakeskin rings, you'll find a huge and varied collection when shopping for luxury rings with Lauren Wolf Jewelry. · Seashells - Whether you're looking for spikes, studs, drops, hoops, or another unique kind of earring, you'll find it with Lauren Wolf Jewelry. Featuring diamonds, pearls, gold, and precious gems, these earrings are true treasures. · Necklace - Really bringing out the beauty of the stones used, the necklaces from Lauren Wolf Jewelry are simply stunning to behold. Formed in a variety of shapes and styles to suit all tastes and preferences, these necklaces can enhance any ensemble. · Bracelets - Last but not least, we come to the bracelets. Designed to add subtle elegance and class to any outfit or occasion and made in a vast and varied range of styles, shapes, colors, and tones, Lauren Wolf Jewelry bracelets will take your breath away. 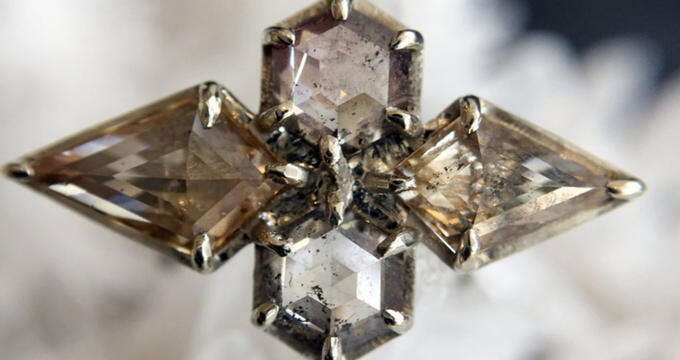 As well as offering a curated collection of stunning jewelry creations, Lauren Wolf Jewelry also proposes a special service for its customers: custom projects. Working closely with clients and putting the same passion and drive into each and every custom project, the expert team at Lauren Wolf Jewelry is able to bring your jewelry vision to life. Perhaps there's a special family jewel you want to celebrate through the creation of a ring or necklace? Perhaps an old family heirloom needs resetting? Maybe you're trying to create the ultimate engagement ring to share with your partner?